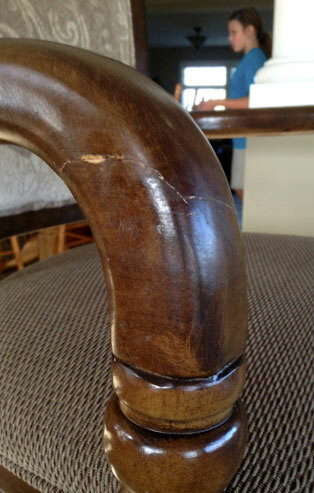 How to Fix a Broken Barstool - Schoenbauer Furniture Service, Inc.
A: Katie Schoenbauer Morgan, at Schoenbauer Furniture Service in Charlotte Hall, Md. (800-955-7603; www.schoenbauer.com), recommends strengthening the repair by drilling a hole from the top of the arm down through the break and gluing in a wooden dowel 3/8 or ½ inch in diameter. Make the dowel short enough so there is a slight recess on the top of the arm. Then, after the glue sets, you can fill the hole with wood filler and stain it to match the surrounding wood. You can also touch up the crack left from your first repair. A clear finish overall will give the repaired areas the same sheen as the rest of the chair. Schoenbauer’s can do the repair in your home in one visit, for $175-$200, plus a $50 travel fee. The company makes free service calls to Washington and much of the surrounding area, but Gainesville is outside the free zone. The company also does repairs at its full-service shop in Southern Maryland.